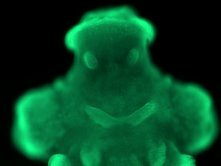 A squid embryo develops from a single cell to a little squid in a few weeks. When it is about 10 days old, it starts to make the structures that will be part of the adult squid. This embryo has been made fluorescent, and is viewed under the microscope. The “hat” will be the mantle–what you eat as calamari rings. The “eyes” will be the gills. The “smile” will form the siphon, used for jet propulsion, and the out-of-focus “arms” will be the big, beautiful eyes.